Summary: As an office worker, you may need to edit a PDF on Mac like change some text or image, or fill PDF forms for business agreement. How to edit PDF on Mac, even if you want to change the text and image, could be one of question many people would ask. This article will discuss how to edit PDF on Mac easily and quickly, including edit PDF content such as change text and image just as in MS Word on Mac. “I got a PDF, and I want to change some numbers in the PDF, how can I edit on the PDF file without Adobe installed?” – Question on Apple discussion. And many other users asked that not able to edit PDFs in Preview on Mac OS. Actually, Preview app on Mac OS not really a PDF editor, it only lets you annotate PDFs, that is markup PDFs, add notes, shapes, and sign documents right from your Mac’s trackpad. If you want to change the PDF contents, involving change numbers in PDF document, or change text and image, add link to text, you may need an effective PDF Editor for Mac. Read on this guide, and edit PDF on your Mac will not be a pain any more. 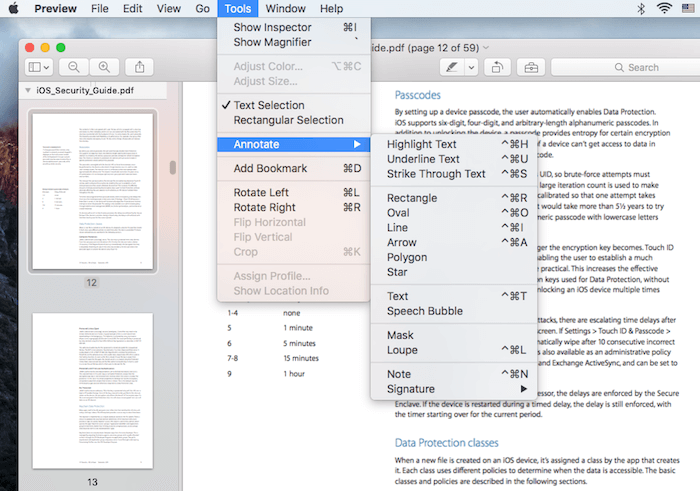 PDF Expert is a lightweight and smart PDF editor for you to edit PDFs. 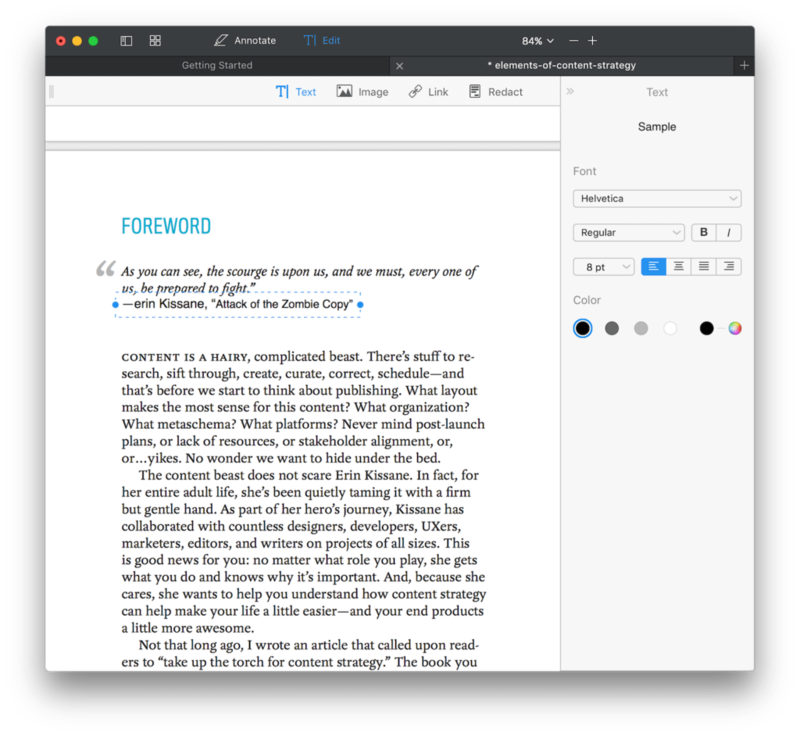 With it, you are able to seamlessly edit PDF text, adjust or replace images, add links to text, and edit outlines on Mac OS. It takes simple steps to do editing on a PDF in your Mac computer. Step 1. FREE Download PDF Expert and install it on your Mac computer. Step 2. Open PDF Expert and start editing PDF contents on your Mac. 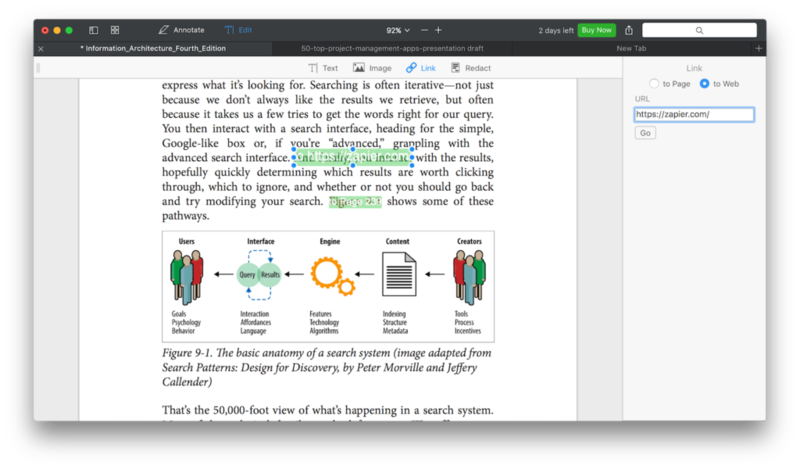 After you downloaded and installed PDF Expert on your Mac, open PDF Expert, in the main interface, click “Edit” in the upper toolbar and now you can start editing PDF contents on your Mac as needs. You may need to make changes on the numbers in a study report, or add some new terms in a contract or fix a typo in your name or street address. PDF Expert could let you do the job with ease. Select “Text” item in the coming Edit interface. Choose the piece of text you want to edit or the place you would like to add new text section. Edit the text content in PDF or add you new texts into the PDF document, PDF Expert will automatically detect the font, size, and opacity of the original text so you can edit PDFs like regular text documents. After the editing has been done, click on the blank space to preserve your text content changes. Note: If want to create outlines for a large PDF document, PDF Expert could let you easily do the editing on creating outlines to ease your navigation through whole files. Just click ‘Edit’-> ‘Add Outline item’ or simply click ⌘⇧ D, and then right click on the Outline item to delete, rename or change destination or add a new item. If you want to edit the image in a PDF file such as change your company’s logo or insert a new graph in a business document. PDF Expert gives you the quick solution. In “Edit” mode, select “Image” button. You are able to add a new image by clicking anywhere in the document, choose the image you want to add and done. 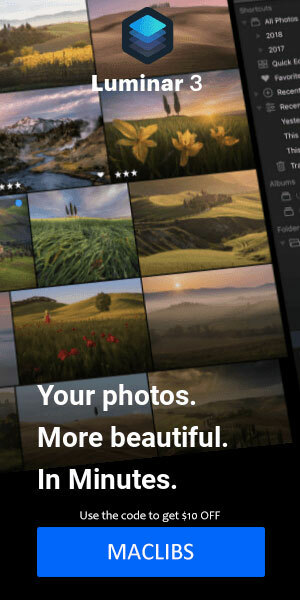 Change the existing image size, move place, rotate, or delete the image could be done quickly with clicks. PDF Expert also allows you do editing on a PDF to link any part of the text to a different page or a website. In “Edit” mode click on the “Link” button. Select a piece of text that you are willing to add hyper link. Set the link destination: ‘to Page’ or ‘to Web’. Done! With PDF Expert for Mac, you are able to edit PDF contents including edit text, change image size or add new, edit links in PDF document, or create outlines in simple steps. What’s more, you even can redact a PDF such as permanently delete or white out sensitive text and hidden data in your PDF with ease. If you got a PDF can’t be edited with PDF Expert, there’s an option to send any PDF file to the developer that you’re having trouble editing due to restrictions, and their customer service team will work whatever magic they’ve got to get your file back to you within 24hrs in a completely useable format with no loss of functionality to the document itself. Although Adobe’s Acrobat DC is an option to do editing on PDF file, but it is an extremely expensive one. 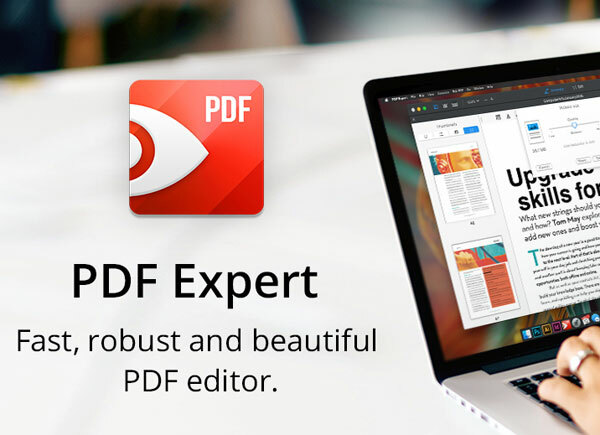 PDF Expert is one of the most cost effective and great tool to doing basic editing on PDFs on MacOS. You are able to edit any number of paragraphs on important documents that you may have trouble converting, or if you’d like to annotate in hand written ink. PDF Expert’s has more amazing features except quick annotations, easy form filling, it also can help you reduce large PDF file size, combine multiple pdf files. FREE Download PDF Expert Trail or buy it right now! Hi, just wanted to leave a comment on the site to share the awesome experience that was had with the above editorial. There was excellent brand awareness off the back of this. Thanks for sharing! PDF Expert for Mac – Powerful Tool to Edit PDFs (including scanned PDF files) easily. There are some attention-grabbing points in this article but I dont know if I see all of them heart to heart. Good article , thanks and we would like extra! Added to FeedBurner as properly. Great post! Just what I am looking for, Thanks! Thanks for this useful tips of editing PDF file on Mac. Bookmarked your blog! I truly enjoy looking through on this web site, it holds superb content . Thanks. Already got the best PDF Editor PDF Expert for Mac! Thank You for this. I can edit my PDFs on Mac easily now. Just got the great PDF editor for my Mac, thanks! Thanks for sharing your notions. Really helpful on editing PDF on mac! Thanks for sharing this informative article, got PDF Expert and edit my PDF with ease, thanks again! Nice post. I was checking constantly this blog and I’m impressed! Extremely helpful info specially the last part 🙂 I maintain such info a lot. I was seeking this certain info for a very lengthy time. Thanks and good luck. Awesome blog! thanks for the helpful solution to edit PDF on mac. Cool tips, helps me a lot on PDF editings. Already got PDF Expert, the best PDF Editor for mac! Thanks for sharing the tip of how to edit PDF on Mac, have already got PDF Expert on my Mac, works really well. I just could not go away your web site before suggesting that I really loved the usual information to edit PDF on Mac. Thank you all for the great solution that I can edit PDF files on Mac with PDF Expert easily. Have a great day! I’m really enjoying the solution your provided on editing PDF on Mac with PDF Expert, I like PDF expert very much, it let me edit PDFs on Mac, iPad, and iPhone with ease. Hey there, You have performed a great job. I’ll definitely digg it and individually suggest to my friends. I’m sure they’ll be benefited from this website. This is a good tip especially to those fresh to Mac. Hi there to every single one, it’s really a fastidious for me to pay a visit this web page, it consists of useful Information. Edit PDF with ease by using PDF Expert. Found this tips on how to edit PDF contents on Mac via Bing, very practical info, will go and get PDF Expert to have a try. Thanks!